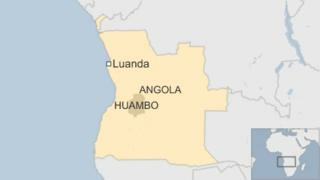 Police in Angola have denied reports that some 200 members of a sect have been killed but they have confirmed 22 deaths, including nine officers. The main opposition party, Unita, says police carried out a massacre in revenge for the officers' deaths. The clashes occurred in central Huambo province when police raided a camp looking for sect leader Jose Julino Kalupeteka on 16 April. He is accused of inciting civil disorder and is now in police custody. Mr Kalupeteka, who formed his Seventh Day Light of the World church 14 years ago after being expelled from the Seventh Day Adventist Church, has thousands of followers across Angola. Unita and human rights activists say that the Angolan army has now sealed off the area around Caala town. "The area is surrounded, people are banned from moving around, and anything that breathes or moves risks death," the statement reads. Police spokesman Paulo Gaspar de Almeida told the BBC's Focus on Africa programme that 13 of Mr Kalupeteka's private guards had been killed because they were "snipers", who had opened fire, killing nine officers. "Those people killed our comrades. And we had to react. Yes… we reacted and killed 13 people." He said that opposition parties were exaggerating the number of deaths for political reasons. Mr Kalupeteka preaches that world will end in 2015, and urges the sect's followers to abandon all their belongings and go on seclusion in camps the mountains.